Can you write your own Vows? Though we have all heard about the bride and groom who stress over writing their own vows, there are quite a few officiants out there who will not allow you to do so. Religious wedding ceremonies, such as those held in an Episcopal or Catholic church, may require you to recite part of, if not all of, their own traditional vows. This may vary from officiant to officiant, so make sure you ask them prior to asking them to conduct your wedding. Are you both Writing your Own? Some brides and grooms simply do not want to write their own vows, while the other partner may. Make sure both you and your fiancé are on the same page about whether or not you are going to write your own special vows. Some partners may also want to write their vows together, or even show them to one another prior to the big day. Again, make sure you discuss this with your fiancé so that you are both happy with the outcome. Do you remember having to outline term papers in school? Vows are not a whole lot different. Setting out an outline with a beginning, middle and an end will help you keep your thoughts on track. You will also be making sure that you are creating one cohesive masterpiece that will be easy for your partner and the attendants to follow. Your vows don’t necessary have to be gushing with the “lovey dovey” stuff. If you want to throw in some humor, go for it! Find your voice and a tone that you feel the most comfortable with. 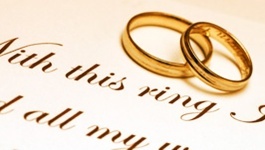 This will ensure that your vows ring true to you and your relationship. Vows are meant to be short, usually within one minute long. You don’t want a long, streaming prose that will take you five minutes to recite. Keep your feelings and your promises straight and to the point. Otherwise, your guests – as well as your partner – may start to squirm and shift. The most important thing to keep in mind is that you keep your vows tailored to the relationship that both you and your partner have. Make promises that you know will make an impact on your relationship and that you both feel strongly about. There’s no sense in copying someone else’s vows that you may have heard at a different wedding or in a movie. Speak from the heart and you will be sure to get a few smiles and tears. The Maid of Honor: What am I Supposed to Do?